Opening a restaurant in NYC is a dream for many. Thousands of these dreamers turn their fantasies into bricks and mortar every year. And, statistically, it’s likely that hundreds of them will no longer be in business five years later. It’s a pretty sobering prospect that does not in any way daunt Cameron Fagan. When we first met her last fall, she was deep into the opening process of her new co-venture Row House, located on the corner of 115th Street and Frederick Douglass Boulevard. “I’m an optimist. And I live in this neighborhood and I know where I would want to go and eat, so as long as I’m true to that, I think it’s going to be great,” Fagan said. Even then, back in October, Row House was well on its journey from idea to reality, gathering momentum through the tricky, touchy, nitpicky stages that make or break an opening. But it had been a long time coming. A week later, the Row House sign went up, clean and sharp in black and white over the romantic French windows opening out onto the street. People passing by stopped to peer in at the stained wooden floor and the tables wrapped in plastic waiting to be set up in the generous space. “It’s a brunch place, right?” a woman asked her friend as they walked past. The room is jumping at Row House. Logistically, there were no major road bumps. “The teaspoons were touch and go for a while, but they’re here now,” Fagan sighed. As the first week flew by in a “bit of a blur,” it seemed that all the staff training (“a lot of it — everyone thought I was overdoing it, but I don’t think so”) seemed to pay off. On Thursday night, the week before Christmas, the joint was jumping. The black-and-white wallpaper glimmered in the light from the string light sculpture, the stained-glass panels glowed, candles flickered on generous wooden tables. 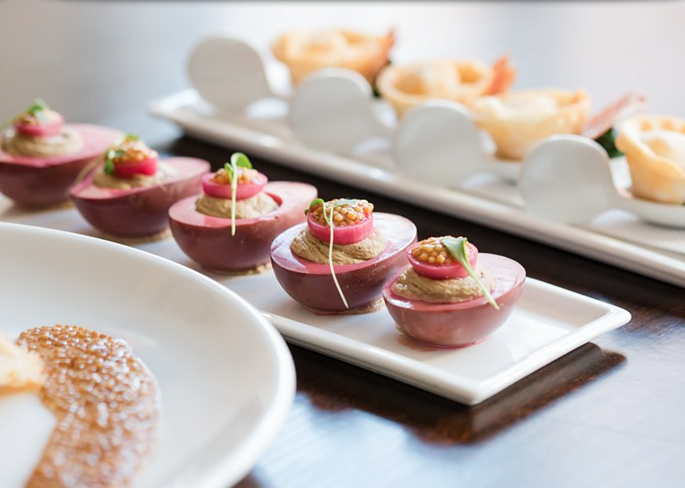 All around, groups of friends and romancing couples tucked into deviled eggs stained a festive purple with beet juice and filled with chicken liver mousse. There was a brisk trade in fried carbonara-filled dumplings, pigs-in-blankets with mustard, and creamy mini–chicken pot pies — well, technically, mini–chicken pot vols-au-vent. Time will tell how Row House settles in to its community, but for now, one thing is certain — a successful opening has been achieved. Oh, and by the way, those cocktail menu covers? Looking awesome.